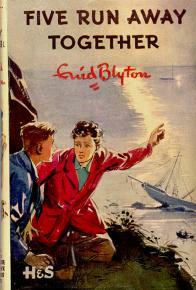 Now if you’re anything like me, you like having the option to read an Enid Blyton book occasionally (or all the time) for nostalgia or because it was the first book of hers you read. I reckon we all have a book or two that we reach to for comfort, like that big hug of a warm blanket and a cup of hot cocoa; its that book we enjoy when we’re feeling down and can make us feel a little better when we’re ill and I wanted to share my comfort reads with you! I love the imagery in this book, the description of the cave and all its amenities is very atmospheric. Also getting to stay on the island is also a lovely idea. I love the waking up at the seaside, and that would be ideal for me! The idea of the adventure on the island is such an exciting thing, and when I was younger it was a such a thrilling idea. The descriptions of the food as well was quite appealing. I used to listen to this on tape when I went to sleep at night and more specifically when I was ill. The use of the pantomime story line used to really fire my young imagination and I think that helped fire my belief that I could do anything I set my mind to. I loved that the audio adaption actually acted out some of the pantomime which just added to the magic of the book as a whole. I really really connected with that book, and even now, when I’ve tired, upset and down, it is one of the books I reach for because it just feels like a big hug. It’s like a welcome home. Again, a Blyton I had on a cassette as a young girl, and the story of the strange mountain that shimmered and made noises was an interesting concept to a girl with no knowledge of chemistry and things, so it was a proper thrilling adventure. I loved the idea of camping in a little hut in the winter, where everything was done by the light of a lovely warm fire. The kitchen at the farm always seemed attractive to me, big, full of food and warm. It’s literally an adventure to sit down and curl up with, a proper real read. So tell me, what are your comforting reads of Blyton? I’m sure you’ve all got different ones, and I’d like to hear what they are! This entry was posted in Personal Experiences and tagged Five Get Into a Fix, Five Run Away Together, In the Fifth at Malory Towers. Bookmark the permalink. Nice topic, Stef. 🙂 My EB comfort reads are “The Valley of Adventure”, “The Castle of Adventure”, “The Sea of Adventure”, “The Secret Island”, the first 3 Famous Five books, “Five go back to Kirrin Island” and “Five on a Secret Trail”. I also enjoy three of the FFO & Dog sequels: “Mystery of the Secret Room/Hidden House/Tally-Ho Cottage”. and “Ring O’Bells Mystery”. They always cheer me up when I’m ill or sad. I always grab a Blyton book when I really feel I need one. Any Famous Five will do, or a Find Outers. Or any Barney Mystery. They are my go-to quickly cheer up books which take me back to more carefree times. Great article. Moreover marvelous website… Its so great to share these blyton feelings with people who actually value her words…. I have read the children of cherry tree farm over 30 times… And I plan on collecting as many old dean and son edition blyton books as I can. Great topic. Cherry Tree Farm and Hollow Tree House were the first books (not short stories) read to me. Some of my greatest go to comfort reads are the Barney series.